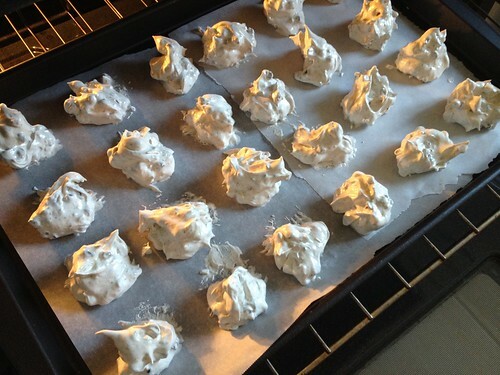 Before you read this post, read the how NOT to make meringues post. Heed my warnings! 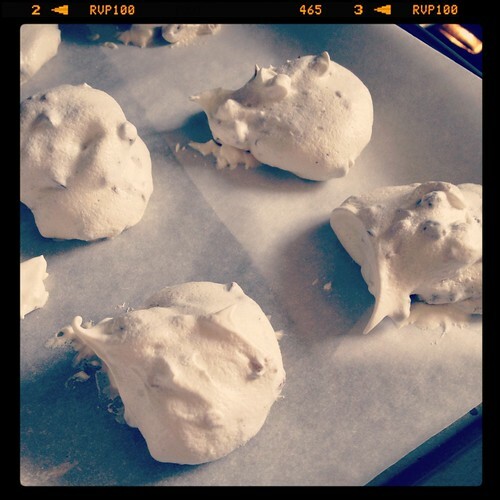 So on Friday night I’d made terrible, terrible meringues for Passover. On Sunday morning I decided to try again. Beat my losing streak. 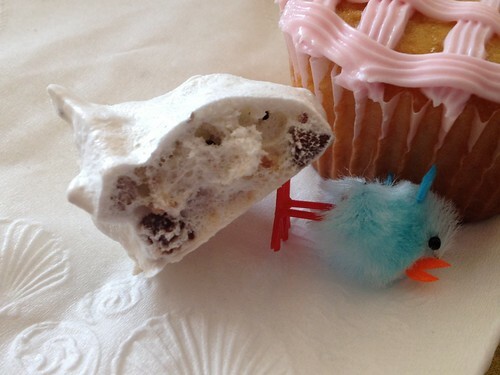 And I happened to be going to an Easter soiree, so I wanted to make good ones and not poison the whole group. Party foul. I didn’t think Smitten Kitchen’s yield would be large enough (just 2 egg whites), so I sort of combined the two sites’ recipes. This involved purchasing cream of tartar, parchment (not just for Torahs! ), another baking sheet (no Pyrex unless called for) and crushed pecans (I already had chocolate chips). I was a little worried about bending the rules again, but this worked out okay (and yielded about 36 meringues). 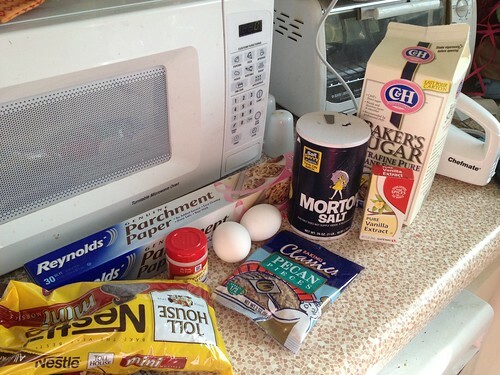 -About 1/4 cup pecans? I forget. Maybe more. 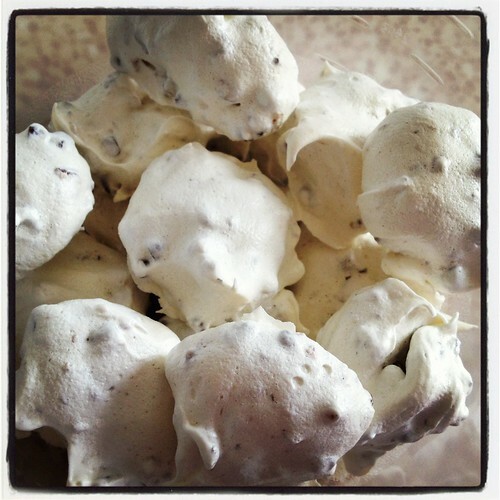 I added the vanilla when Smitten Kitchen directed — when you add the cream of tarter and salt. I also liked that they didn’t tell you times and settings after all — it’s easier to just go by, when the eggs are foamy, do this. Or when they have soft peaks, do that. 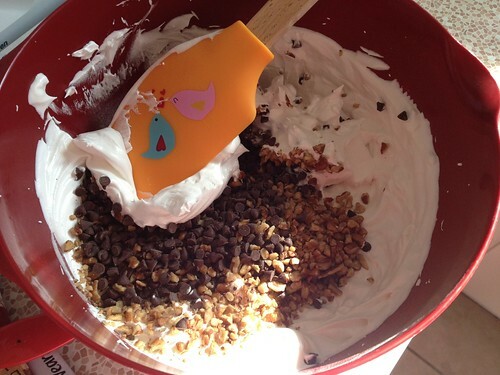 And you can definitely tell when it’s done, because it’s hard to keep mixing. 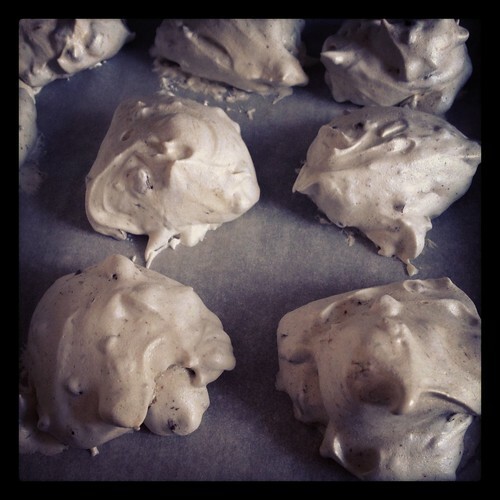 This time I folded in chocolate chips and pecans, hoping nobody was allergic. 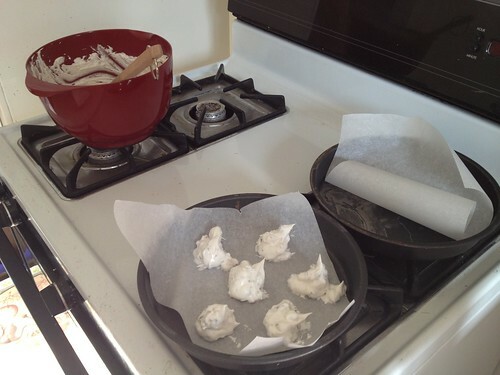 And then I scooped them onto parchment, and 3 egg whits turned out to be so much that I needed all sorts of backup pans. Call in the backup pans! They came out looking like beautiful, beautiful clouds. Mission accomplished. Another shot! Just to celebrate them not poisoning me this time! They were melt-in-your-mouth. And while they weren’t exactly HUGE competition for Funfetti cupcakes with really adorable frosting, I will say that my friends were VERY impressed that ALL those meringues came from just THREE egg whites. Inside view! Where the mix-ins are hiding. I ate the leftovers for breakfast for several days (I thought they were better 2nd day), because — hey! 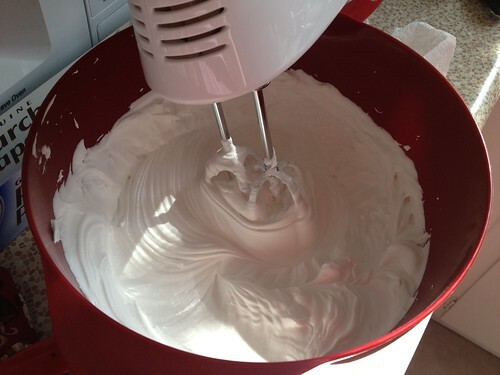 Egg whites! They’re what’s for breakfast. 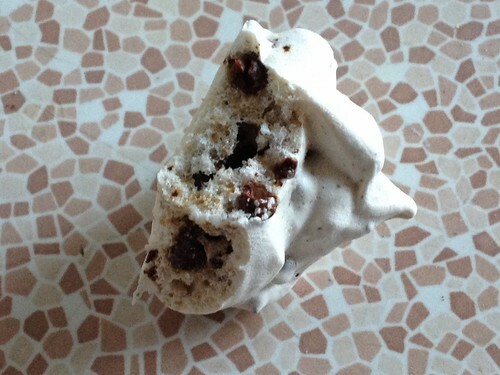 I will say that the meringues did smell a little odd. Like — eggy? So I tried not to take any big whiffs. They still TASTED good. Today I made a smaller batch for yet another party (for my friend who goes to PASTRY SCHOOL — COOL! ), and I used the Smitten Kitchen proportions/recipe, but replaced the nuts (nut sure if anybody had allergies) with a little more than a tablespoon of instant coffee. So it’s a mocha flavor, I guess. The yield for 2 egg whites was 24 — not bad! (I actually counted these, and did the math from to approximate the 36 from 3 egg whites.) I still did the 1.5 hour bake at 200 degrees. Are you gonna be edible? 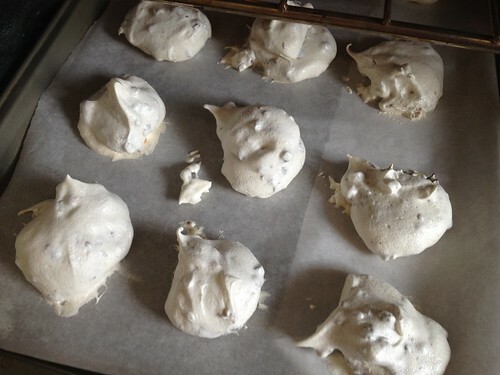 I’m sure it was unintentional, but one of your pictures is of a meringue crushing a baby chick.